The May issue of Total Girl magazine is out now. 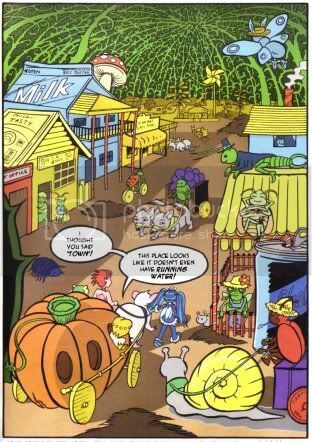 Here's the second page of this episode of Dillon's Rock 'N' Roll Fairies, drawn by me, with colours by Tamara. I'm really pleased with how this page came out, as getting the balance in the details right was tricky (I had old milk cartons and stuff lying around the floor while I was drawing it). 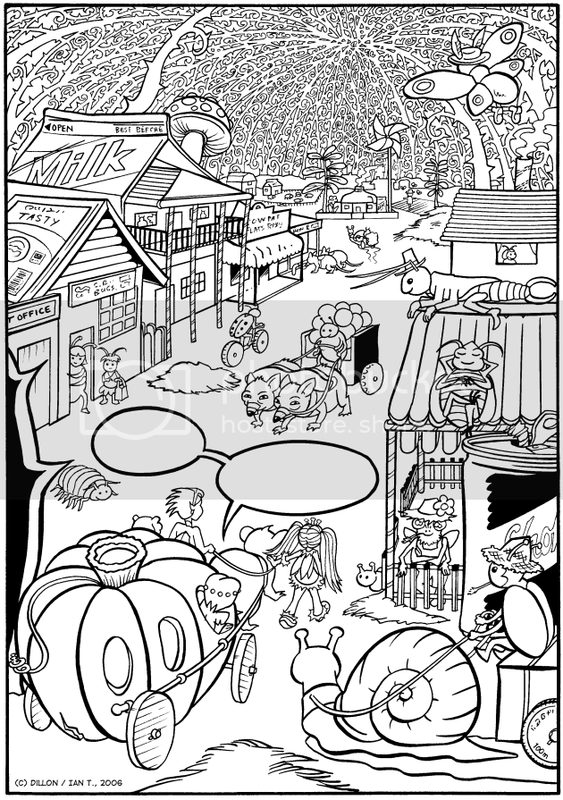 This was a lot of fun to draw, combining my interests in bugs and old country towns. Some of my favourite details are in the far background. Below is a scan of the original black-and-white page, sans colouring and lettering, so you might want to colour it yourself (or even caption it a bit differently). Thanks, Aravis and Anonymous. Yeah, this is a very traditional (black line and flat colour) approach to comics, but it still works best for this sort of material. A lot of modern comics strike me as overworked and tiring to look at, especially for kids. Anonymous, you'd need a very committed tattooist to persist with those thorns! WOW!! Very neat intricate illo! Holy cow that's some detailed inking! nice. Ian this is so wonderful! I love it so much!!! I am so glad you say you had so much fun making it because I was thinking when I was looking at it that this is a dream job that looks like so much fun to make! Absolute perfection!! !